Crack 2 eggs in to a large bowl. Whisk it. Add powdered sugar and whisk gently. Melt butter/ghee in a thick bottomed sauce pan in a low heat. Add in the grated chocolate and stir well. When its getting melted, switch off the flame. Let is rest for a few minutes. Then add this to egg sugar mixture and stir thoroughly. Add in 2 drops of vanilla essence. At last fold 1 table spoon flour in it without lumps. Then again another table spoon of flour. The batter for molten lava cake is ready. Preheat the oven in 220 d.
Lightly apply butter in each ramekins. Then dust it with powdered sugar. Fill in 3/4 of the ramekins with the batter. Bake the cake in 220 for 14 minutes. When its baked, take the ramekins out of the oven and let it sit for a minute, Run a knife through the sides of the cake and invert it to a serving dish. Cut and open the side portion of the small cake and you can see delicious chocolate lava is oozing out..!! Serve hot with any side dish..
By referring this recipe, you can prepare 6 molten lava cakes, if you use small sized ramekins. Check these cake recipes also. 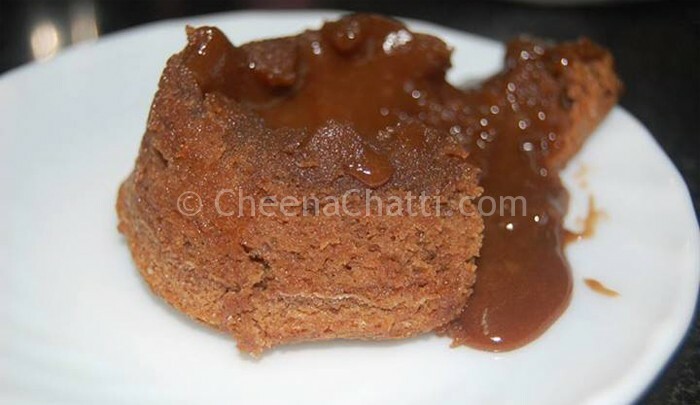 This entry was added on August 29th, 2013 by Athira Sooraj in Bakery and tagged with lava cake, cake, cakes, molten lava cake recipe, chocolate lava cake, molten cake. Last revised on April 4th, 2018. @Amritha: Thanks a lot for your encouraging words..